Solar elecricty is electricity that has been generated by a solar pv (photovoltaic) system. Solar electricity is generated when particles of light energy called photos hit a photoelectric cell. These particles cause a chemical-physical reaction to take place within the material causing an electric charge to move through the photovoltaic cell. This electrical charge from the solar pv cell creates a voltage and a current flow resulting in useable electrical power. The solar cells which convert the light energy into solar electricity are connected together in a large number, normally around 60, in order to make a solar pv panel (sometimes called a solar module). These solar pv panels in turn are connected to other solar panels in a string in order to make a solar array. In grid-connect solar pv systems these solar arrays will be connected to a solar inverter which will convert the direct current (DC) solar electricity into useful alternating current (AC) solar electricity. This AC solar electricity can then be utilised by electrical components within the property or exported back to the national grid. 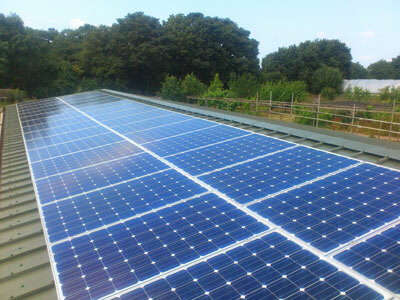 In off-grid solar pv systems there are two options. You can connect the solar array to a special type of off-grid solar inverter which will convert the DC solar eletricity into AC power that can be used by any AC appliances. However if you only have DC appliances, eg DC lights, you do not need to use a solar inverter and can draw DC electricity straight from the panels or battary. This saves on cost and is a bit more efficienct, however it makes the system a little less practical as most electrical appliances are designed to run off AC electrical supplies. You can have off-grid solar systems that have both DC and AC outputs. Solar electricity has a number of benefits over traditional types of electricity supply. The supply of solar energy is free for everyone. So once the capital outlay is paid you have a free supply of energy for your property. Solar pv panels are very reliable. They have no moving parts and should continue generating solar electricity for at least 30 years or so. Security of energy costs. If electricity prices rise in the future you are protected from this by your solar panels. Off-grid solar pv systems can be mobile. You can move them from place to place where power is required. It can be much cheaper to install off-grid solar photovoltaic systems in remote regions of the world than to spend money developing national grids for 100's or 1000's of miles.